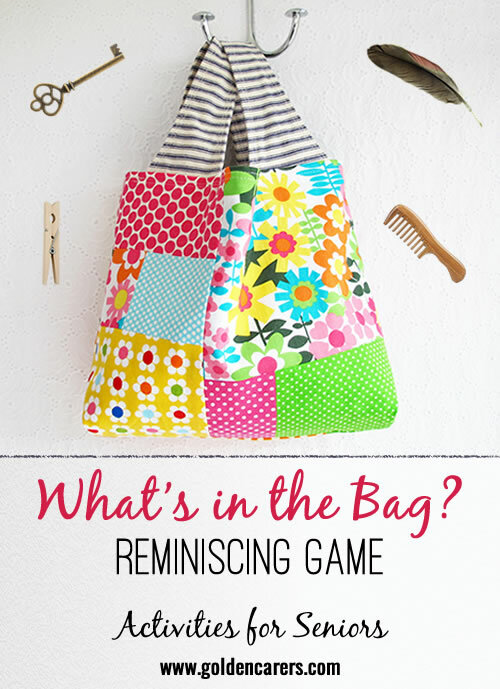 Chose a colorful bag, something that catches the eye, silk, or any other fabric that feels good to the touch. You don`t want to be able to see through the bag. It might have a rope so that you can tie it shut. Find random objects, such as kitchen utensils, keys, padlock, sun glasses, can of soup, feather, button, pen, various tools, bobbin, spool, yarn, zipper, clothes pin, hole puncher, the list can go on and one. I am aware that you all have a vivid imagination. You can put in one object at a time, or more. They can either try to guess the object, say what the object can be used for, or count the objects in the bag. Without looking in the bag. Timer is provided as some individuals just need to figure out what that object is! You can have various alternate options on how you can add some flare to it. The participants love this game, clues can be supplied if needed, allowing for a successful round of guessing. It is great if they can retain what they have felt to keep silent until the last person has the opportunity to feel the bag. A piece of paper can be supplied so they can write it down if they feel comfortable doing so. This adds another dynamic to the game, retaining their writing abilities. Kudos again to you, on all of the wonderful resources you provide! I have a large box of assorted items such as watch, spoon, clothes peg, toffee hammer a real assortment of items. I use a large cloth bag so there is plenty of room. No one says what it is until everyone has a turn. We then say together what it is and if it for example a spoon how many different types of spoon we can name. How many different types of hammer etc . You can have items that are very easy or very hard so that everyone is catered for. Played this game for an hour with 10 residents they liked thinking of different types of the item as much as guessing. I had to prompt those residents with mid-stage dementia each time not to tell the answer till all had a turn but every level enjoyed the game. Thanks Susan, this is such a great game isn't it! I tried this yesterday I had to modify slightly as had a very large diverse group so when resident pulled out a spoon we thought of how many types of spoon we could think of, alarm clock how many different types of clock. The only one no one guessed was the tin of shoe polish everyone thought it was a powder compact! Thanks for sharing Susan, lovely to hear everyone enjoyed. Great idea to extend the game by reminiscing about the objects too! Looking forward to trying this, sounds fun! We had a wonderful time with this activity last week. I had 3 bags (pillow cases) with 20 identical items in them. Our clients all had a turn through-out the day during our other activities and recorded the items on their list and we 'revealed' the items during afternoon tea time. One client got all 20! A job worthy of a mini Mars Bar. Some of the items were: Knife, fork, soup and sweet spoons. Hookey ring, dvd, dice, calico teddy, ball of wool. Great game Chant, love it!